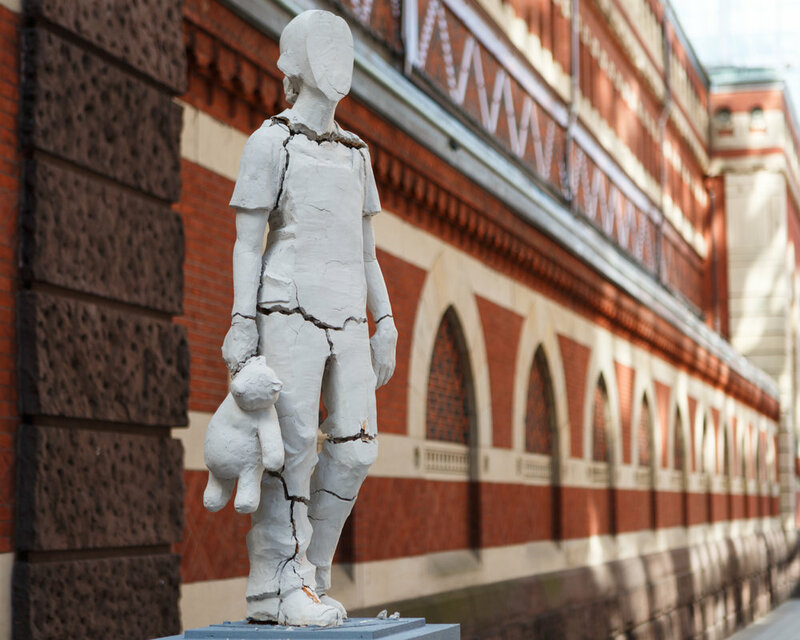 Bruguera collaborated with students and staff from the Sculpture Department of the Pennsylvania Academy of the Fine Arts (PAFA) to create a series of identical clay immigrant figures. During the exhibition, one was mounted on an outdoor plinth in PAFA’s Lenfest Plaza, between Claes Oldenburg’s monumental Paint Torch and Jordan Griska’s naval-plane-turned-terrarium Grumman Greenhouse. The pedestal’s plaque was inscribed with the following text: “In memory of all the new immigrants, who have the strength to start over and give so much to others.” After weeks of weathering, the unfired sculpture deteriorated and was replaced by an identical one. As the summer ceded to fall, the change in humidity caused the clay to crumble, exposing the steel frame that held the figure together. This cycle of installation and decay repeated throughout the exhibition. Bruguera’s poetic series monumentalized arrival, adaptation, loss, and renewal, as an allegory of immigrant experiences in the United States. Partners: Mural Arts Philadelphia, Pennsylvania Academy of the Fine Arts. Monument to New Immigrants was presented as a part of the Monument Lab: Philadelphia (2017) exhibition. The city of Philadelphia played a pivotal role in shaping the future of the United States: it was the place where the Founding Fathers met to sign the Declaration of Independence (1776) and the Constitution (1787), and it served as temporary capital while Washington, DC was being built. Philadelphia was also one of the cities that saw a massive influx of immigrants from Europe and Puerto Rico, and it welcomed many African Americans who were migrating from the rural Southern United States to the Northeast during the Great Migration between 1916 and 1970. Thinking about the city's great history of hospitality and the role that it played in shaping democracy in America, the project consists of a sculpture dedicated to newly arrived immigrants. The statue represents a kid as a metaphor for what is experienced once you immigrate: no matter how old a person is, they need to start over. The idea behind the statue is not to represent a particular community, but all the immigrants; for this reason, they don’t have any specific gender or appearance, and they do not have a “face.” The lack of facial details is a way to emphasize the sense of precarity that immigrants experience: they are not always in one place; part of them is somewhere else, in their home country, and their identity is formed by their experiences in their new place. The kid walks with a bear, which represents their personal memories. In this way, the immigrant could be seen as a hero and they are never identified in a particular historical figure or any particular migration wave or time period. The sculpture will be clay, and it will be very detailed; however, it will be exposed to rain, wind, and sun in order to deteriorate and slowly disappear. This performative aspect of the sculpture explains the perpetual and endless condition of immigration: when a community is accepted, there is always a new one asking for hospitality. In the same way, when the first sculpture is completely deteriorated, a new one will be placed on the pedestal to start the process again. This is not only a place to celebrate the newly arrived immigrants, but also a call for solidarity between those who are already established and newly arrived immigrants. 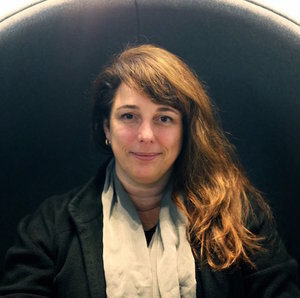 Tania Bruguera is an installation and performance artist whose works often expose the social effects of the power of political force. She participated in the Documenta 11 exhibition and also established the Arte de Conducta (Behavior Art) program at Instituto Superior de Arte in Havana. Her work has been shown in the 2015 Venice Biennale, at Tate Modern, London, Guggenheim, and MoMA, New York, among others. Bruguera has recently opened the Hannah Arendt International Institute for Artivism, in Havana—a school, exhibition space and think tank for activist artists and Cubans. Born 1968 in Havana, Cuba, she lives and works in Havana, New York and Cambridge.